Today I want to share with you a very soft lay-out, with natural colours. 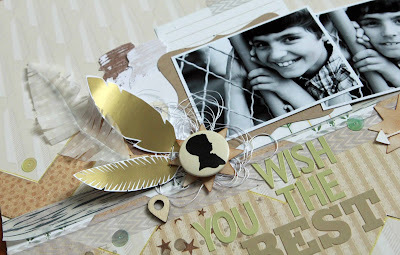 And I so wanted to use the new feather gold rub-ons from Jenni Bowlin Studio!! 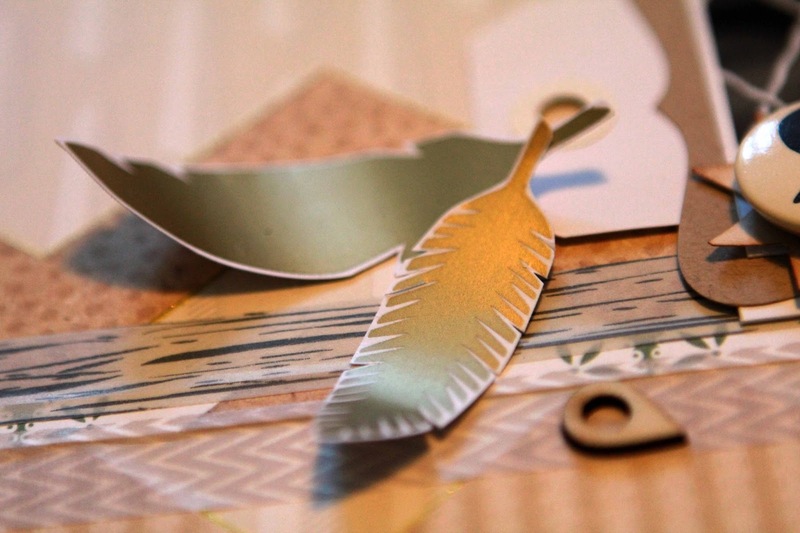 I was definitely inspired and guided by these pretty feathers to create this lay-out "Wish you the best". 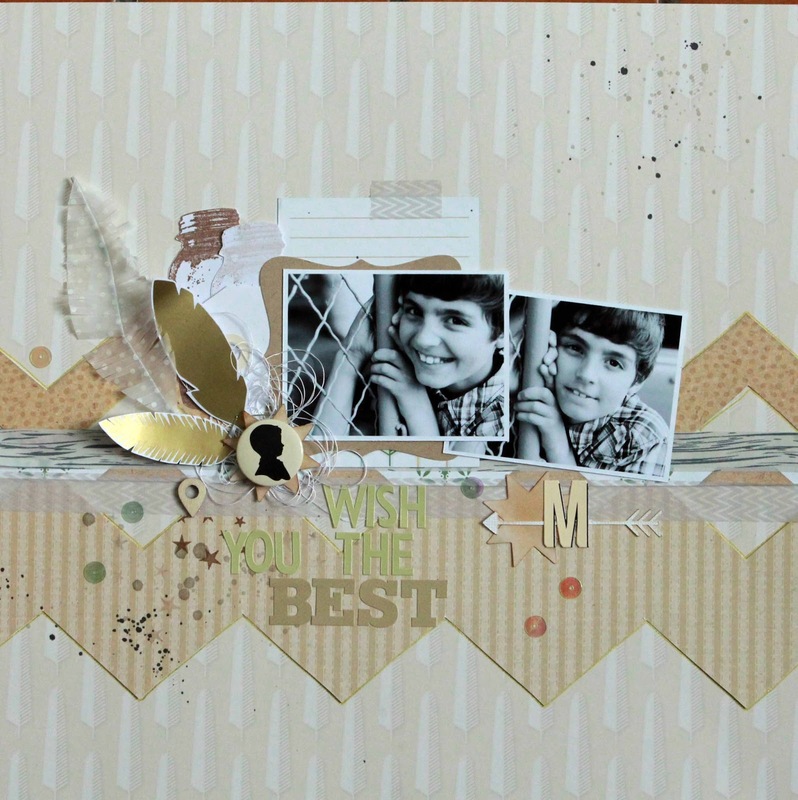 Here is the kit I gathered to create this lay-out: papers from the Modern Mercantile collection, the feather gold rub-ons, the bottle stamp from this month’s kit, a white feather from Wired feather, alphabets, a pretty vintage badge Flatbacks and one of the newest Jenni Bowlin Studio punches. 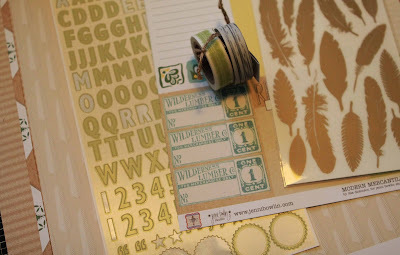 I had fun using the Modern Mercantile papers: I chose the softest patterned ones for a very natural atmosphere. 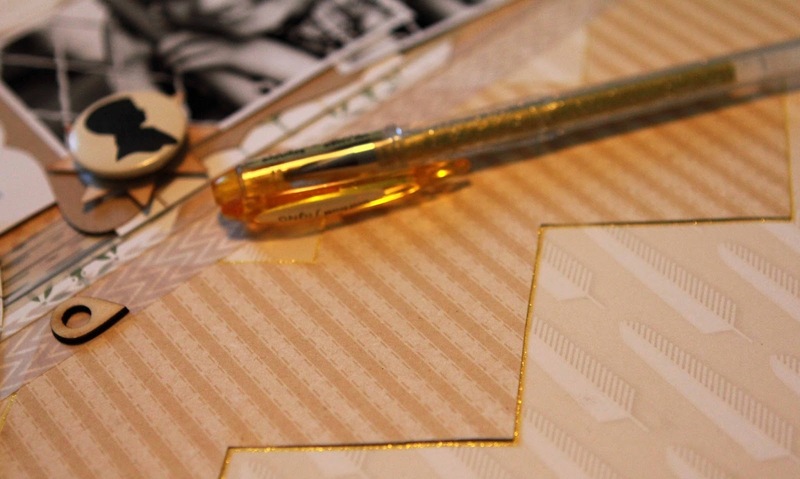 The „Mélange“ paper is used as background paper. 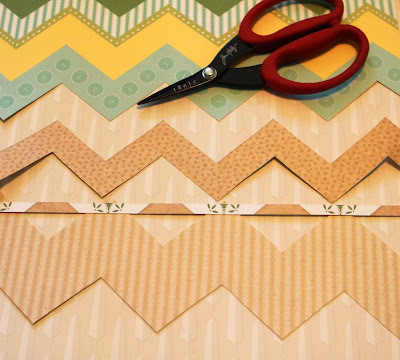 I cut zigzag shapes out of the „Sundries“ paper to give a dynamic note to my lay out. The "Hodge Podge" paper will be glued under one of my pictures. I glued two stretches of Jenni Bowlin Studio paper tape between two strips of paper. These two natural shades are really pretty! 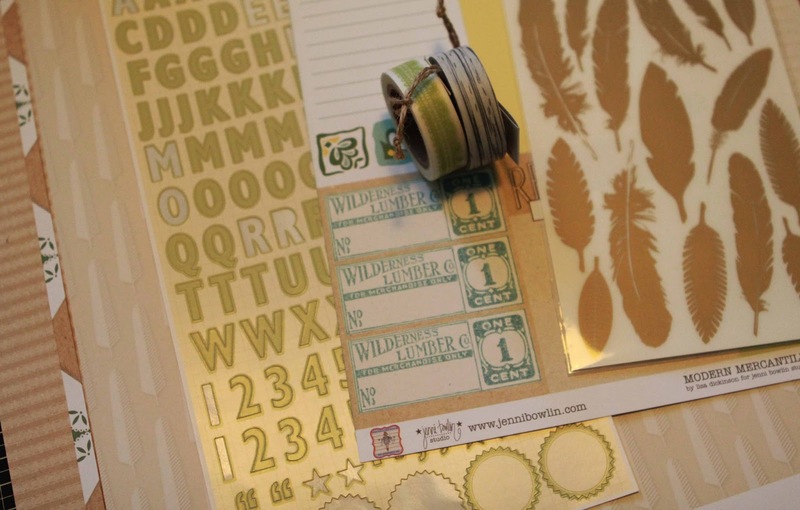 Now let’s play with stamps! I stamped each pattern twice on a scrap paper with sepia Versafine. I cut out two bottles and glued one on top of the other. I applied the feather rub-ons on a white cardstock, and then cut them out with scissors. The edges are slightly curved to bring volume. The feathers are glued side by side next to my main picture. I cut a little star with the Jenni Bowlin punch and added a „shape“ badge to finish the decoration. To add volume and softness, I had fun adding some white thread. Now it’s time to add a title and some embellishments here and there. Don’t forget the ink splashes as the finishing touch! And I also outlined the edges of all my patterned papers with a golden-tipped pen, as a reminder of the gold feathers. I hope you liked my lay-out! See you next month! Pretty layout! The gold is the perfect touch.